Here are the latest charms I have made. These are for a swap on Two Peas in a Bucket called Vintage Christmas Charm Swap . I have use a soft gold sew on plastic crystal. 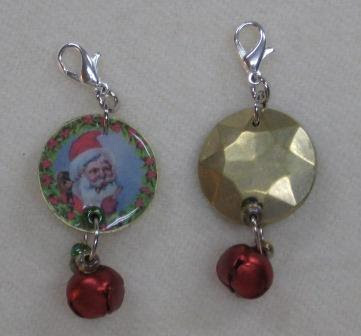 They have two holes, so one is used to attach to the clasp and the other has the red bell and beads. I got this vintage Santa image a few years ago from a fellow mixed media artist. She had a collection of old Christmas cards she had scanned and was sharing.